The Arts District has a new coffee shop and roaster. 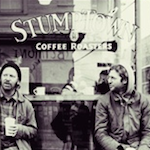 Since 1999, Stumptown Coffee has been roasting direct trade coffee beans in Portland. They were one of the first artisanal roasters on the West Coast, and as of today, they’ve opened up a shop and roasting facility here in L.A.
On Santa Fe, just down the street from Bread Lounge in the Arts District, Stumptown L.A. has taken over a large industrial space and outfitted it with a German-made coffee roaster, several La Marzocco espresso machines, and plenty of Stumptown beans. The roasting facility isn’t fully operational just yet, though. Vice President Matt Lounsbury says that they plan to start roasting in L.A. “as soon as possible.” It seems that permits and inspections are holding up the process. Adjacent to the roasting room, and in full view of walk-in customers, is a cupping and training room. Evan Dohrmann heads up the wholesale side of things, and will soon train baristas and wholesale clients here. Eventually, the room will be opened up to the public for educational cuppings and tastings. For folks just looking to grab a good cup of jo, see General Manager David George. He’s currently training staff on the Stumptown way of things. A menu of unique pastries (including a must-taste chocolate chip miso cookie) is on offer from local wholesale bakery SugarBloom. Lounsbury says the shop may eventually diversify food offerings and include a few more savory options, but their focus is currently on the coffee. Stumptown L.A. is now open from 7 a.m. until 6 p.m. daily. Stumptown Coffee, 806 S. Santa Fe, Arts District, stumptowncoffee.com.